Software driven Digital Asset Management solution, featuring best-in-class technologies and workflows. Designed from the ground up to be modular and scalable, it intelligently grows with your requirements. The volume of digital content is exploding, with incredible growth in rich media– video, photo images, complex graphics files and the like. Call it Digital Asset Management (DAM), Content Management or any one of a dozen other terms, it all adds up to a big challenge for organizations of every size and type. We offer products to enable dramatically easier asset cataloging, searching, storage and distribution, with support customized to fit your needs. Manage, organize, share and download digital assets. Easily distribute content to users and customers. Featuring best-in-class technologies and workflows. product management and production tool for anyone who distributes products on discs. Accepts an order on-demand for a pre-defined product and produces the required disc. suite of programs that allows automated, unattended downloads of photos, videos and other files from a dedicated email inbox, or from cloud services. Splits large media files into chunks of a configurable size, and then sends each chunk to a specified address. Also has a “watch folder” feature for processing. 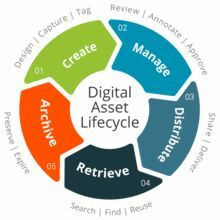 By utilizing a Digital Asset Management (DAM) system such as MediaBeacon, or a Content Management software such as Digital Warehouse, organizations can distribute content and products to end users and customers using the internet with high-speed file transfer software like Aspera, or with CDs, DVDs and Blu-Ray discs using Rimage systems. The requirement to keep data safe can be met in a variety of ways including encrypting all of the content on a CD, DVD or Blu-ray disc using SecureDisc. Rimage Disc Publishing Systems are the industry standard for integrated delivery of content on CD, DVD or Blu-Ray. SecureDisc, Digital Warehouse and MediaBeacon all have workflow integration with Rimage disc publishing systems, so assets can be distributed on permanently printed and personalized CD, DVD and Blu-Ray media as easily as printing to paper. Aspera is the leader in moving the world’s data at maximum speed, regardless of file size, transfer distance and network conditions. With the unstoppable explosion of Big Data in a world where IT and networking infrastructures are more diverse and flexible than ever, Aspera focuses on supplying innovative data transfer solutions that help organizations operate and collaborate more effectively on a global scale. The ever growing challenge of processing and storing data is a constant concern for every organization and there is no ‘one size fits all’ answer. GTGI understands the diverse server and storage options available in the market (as well as the need to leverage an organization’s existing infrastructure) and can provide organizations build a seamless storage workflow. GDAM Servers are customized servers based on customer needs. GDAM Storage are self-contained RAID solutions that appear as a regular disc drive. They are easy to administer and are available in configurations up to 100 terabytes, in desktop and rack-mount chassis. Information security (or lack thereof) is the subject of daily new stories and can be one of the greatest threats to an organization. GTGI has a deep history in both data encryption and access control that can become a part of every project we undertake. Whether data is being stored on hard drives, distributed via the web, sent out on physical media or retained in an off-line archive, many organizations need to control access to their content. SecureDisc is the best disc encryption software on the market today. Every CD, DVD or Blu-Ray disc produced using SecureDisc is encrypted with a FIPS 140-2 verified AES 256-bit engine. It’s multi-session capability provides disc producers the ability to create content in both ‘clear’ and encrypted sessions. PowerCrypt is a gigabit-ready hardware encryption accelerator. We take analog videotapes from any video format and converts them into digital versions, providing much more efficient storage and long-term preservation. Your videotapes degrade and can become unwatchable in less than 10 years. Transfer your videos to DVD to preserve them. You’ll recieve backyour original plus new digital copies, ready for reviving and sharing.